RTA buses run from downtown Dayton to Wright State and from downtown to many other destinations. RTA passes and schedules are available at the Barnes & Noble Bookstore, 182 Student Union. The RTA's phone number is (937) 425-8300. The RTA bus that services the Dayton Campus is #1. All buses feature bike racks and meet ADA accessibility guidelines. Scheduled rides that pick up and drop off riders at any location within Greene County and with limited service to Montgomery County from Monday–Sunday 6 a.m.–9 p.m.
Flex routes have scheduled stops that link the Greene County communities of Beavercreek, Fairborn, Xenia, and Yellow Springs. 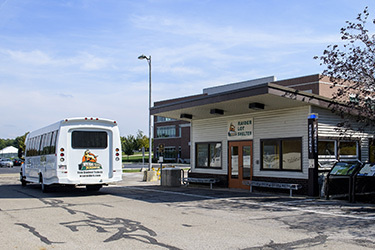 You can board a RTA bus at Wright State's Student Union Monday through Friday from 5:30 a.m.–7:30 p.m. You can request a change to a flex route up to 1/2 of a mile at least two business days in advance. Call the scheduling office between 8 a.m. and 3 p.m. on Monday through Friday. All buses feature bike racks mounted on the front of the bus for carrying bicycles and meet ADA accessibility guidelines. Lots 4 and 4A have ample parking available to accommodate park and ride permit holders. Beginning Spring Semester 2019, all park and ride permit holders should park in available white-lined student spaces in lots 4 or 4A. This change will give you closer parking, will allow the university to conserve resources, and fulfill a request from the Student Government Association to provide limited shuttle service to on-campus housing through the winter months. Park and ride permit holders can only park in lot 4 and 4A white-lined spaces. During Fall and Spring Semesters, Monday through Friday, the Raider Ride buses provide transportation to and from Millett Hall and the McLin Gym at the Nutter Center. Service is not available during university-observed holidays and breaks or during Summer Semesters. You can get bus schedules below, on the shuttles, or at the Customer Care Center in 065 Allyn Hall. Miami Valley rideshare is a free ridesharing service is provided by the Miami Valley regional planning commission. If you are interested in sharing a ride or have questions, visit the Miami Valley Rideshare website or call rideshare at (937) 223-SAVE (7283) or 1-800-743-SAVE (7283). Our partnership with Zipcar provides two vehicles for students, faculty, and staff at an affordable rate 24 hours a day, seven days a week. Gasoline, insurance, a reserved parking spot, and up to 180 miles of driving per day are included in Zipcar rates. You can reserve cars for as little as an hour or for multiple days. 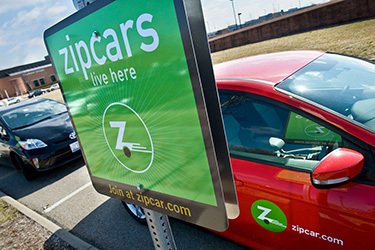 Join Zipcar at zipcar.com/wrightstate.